A change of plan in Miami? 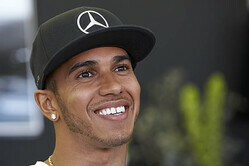 According to the Sunday Times Rich List, which is to be published next month, the 29-year-old is currently worth around £68m, an improvement of around £8m in the last year, while former teammate Jenson Button is second in the wealth standings - but eighth in the world championship - with £60m. Other than salary and prize money, the list is compiled by including all assets such as property, shares in publicly quoted companies and even art. The highest placed footballer on the list is Manchester United's Wayne Rooney who has accrued £60m. Rooney's teammate Rio Ferdinand is fifth overall with around £44m to his name, while 2013 Wimbledon champion, Andy Murray, saw his fortune increase by a whopping 25 percent last year to £40m, placing him sixth on the list. F1 trademark row to resurface? Please note that all posts are reactively moderated and must adhere to the site's posting rules and etiquette. Sign in or register for a Pitpass ID to leave a comment here! No comments posted as yet, would you like to be the first to have your say? Copyright © Pitpass 2002 - 2019. All rights reserved.